In celebration of the arrival of our baby girl, last night hubby and I headed into the Big Smoke to enjoy some Indian fine dining at The Cinnamon Club in Westminster. 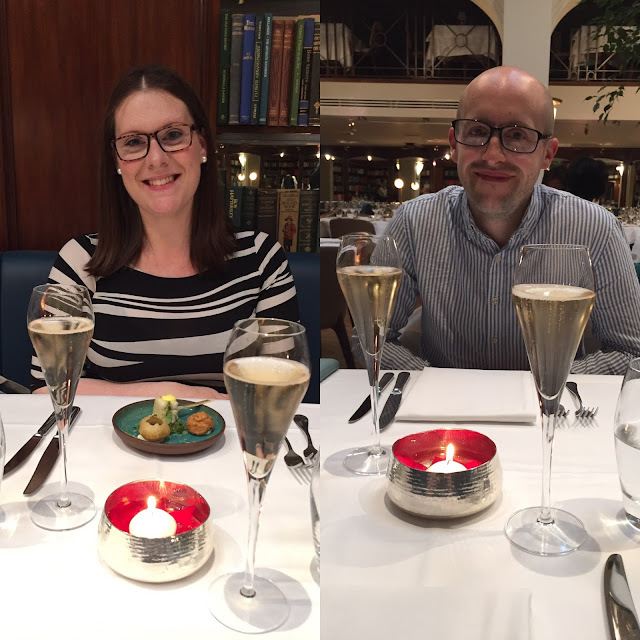 We were invited along by Bookatable.com to try out the restaurant's Lazy Sunday 3 course menu, which comes with pre-starters and a glass of champagne as standard, all for £40 per person. We had heard only good things about this restaurant, which, incidentally was named Bookatable's 'Best Indian Restaurant in London, 2016'. So we had high expectations! The booking process through the Bookatable website was faultless - the website provides ample information about the venue, along with pictures, reviews and sample menus to look at, as well as a link to the restaurant's official website. The deal is clearly explained for the customer, and it took a matter of minutes to search for available dates/times for us to visit. After booking I received a confirmation email instantly, as well as a reminder email shortly before our visit and our table was ready and waiting for us on arrival, and I hadn't even had to pick up a phone! Result. It was an amazing treat to head out on a date night with Liam minus the kids - the last few months have been a bit of a blur, with the slog of being heavily pregnant, followed by Connie's super speedy/crazy birth (you can read her birth story here) and then the foggy haze that is the first two weeks with a newborn - we've sort of been in auto-pilot mode: making bottles, changing bums, washing clothes, not sleeping...so it felt really great to get dressed up, straighten my hair, and head out without a changing bag and buggy in tow. 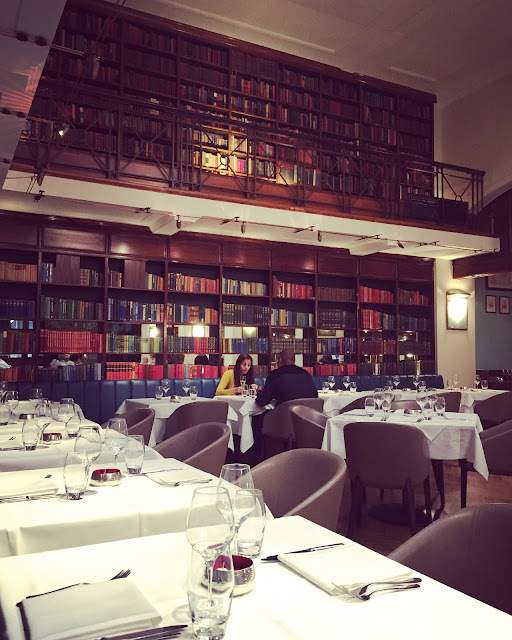 Set in the historic Grade II listed former Westminster Library, The Cinnamon Club is an institution in the world of Indian fine dining. 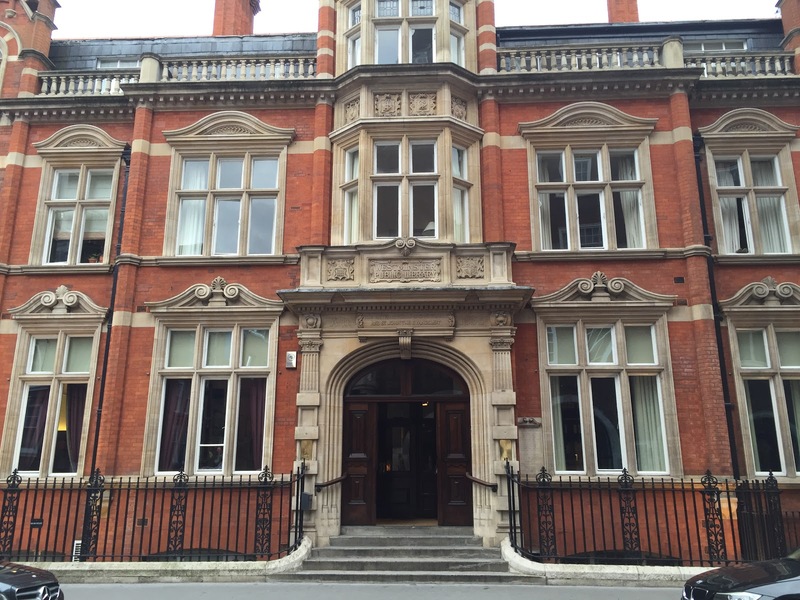 The original modern Indian restaurant in London, The Cinnamon Club has a long history of serving innovative and creative Indian cuisine in a magnificently majestic setting. Re-opening in 2015 following a major refurbishment, Executive Chef Vivek Singh and Head Chef Rakesh Ravindran Nair have developed a stunning new menu that combines The Cinnamon Club’s signatures with new dishes and celebratory platters. We were so excited to try the special Sunday menu! 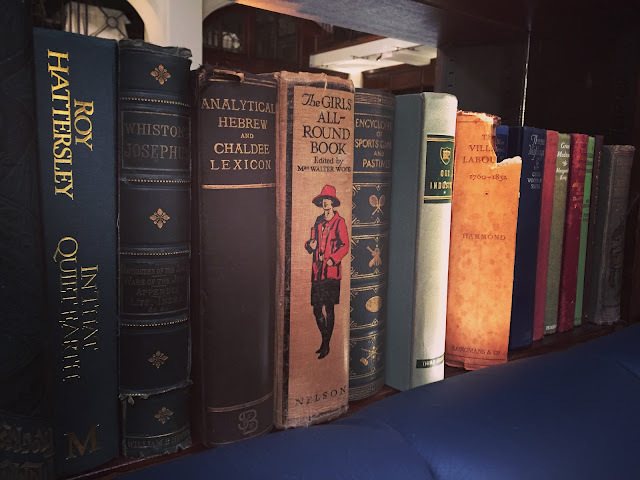 The restaurant decor is perfect for a bookworm like me. 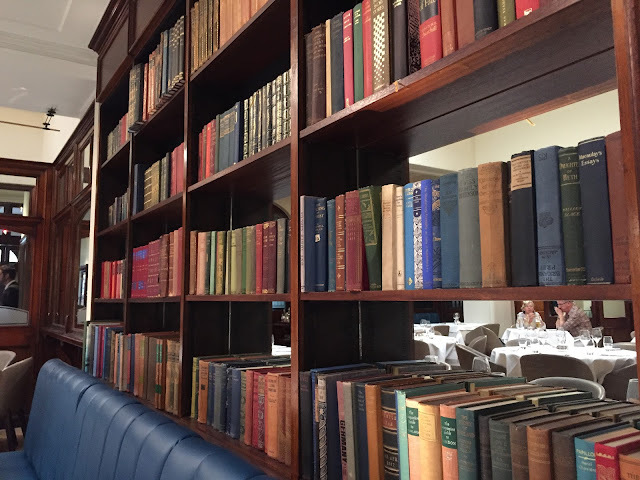 The decor inside the restaurant is traditional meets modern with a rather large nod to the building's library roots: the walls are lined with hundreds of beautiful old books...I genuinely felt like I was deep within the Beast's library (I'm a HUGE Beauty & The Beast fan!) The interior really did take my breath away. The deal we booked with Bookatable meant we had to order from the Lazy Sunday menu, and we were so pleasantly surprised by the array of choices on this menu: there is absolutely something for everyone with five starter options, six different main courses, and four desserts to choose from. We firstly enjoyed a selection of pre-starters: delectable Indian finger-food to whet our appetites and get us fired up for the meal to come. Each morsel on this plate was not only beautiful to look at, but a marvellous eat - considered, beautifully balanced between spicy and sweet, with a creaminess and tang from yoghurt, a zingy freshness of herbs and some wonderful textures made this a beautiful eat and the perfect way to start the meal. 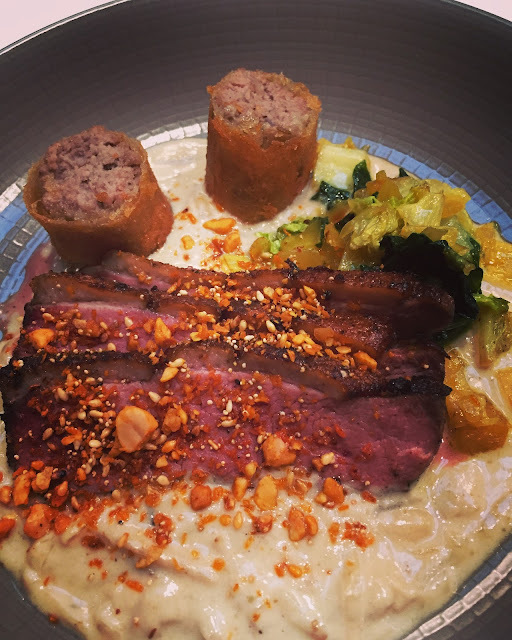 My Starter: Seared Gressingham duck breast, spiced leg and mappas roll, sesame peanut crumble. My starter didn't disappoint - the duck was perfectly pink (what a treat to be able to eat rare meat again, after 9 months of a cautionary pregnancy diet!) with a delicious nut crumble to add bite and texture. 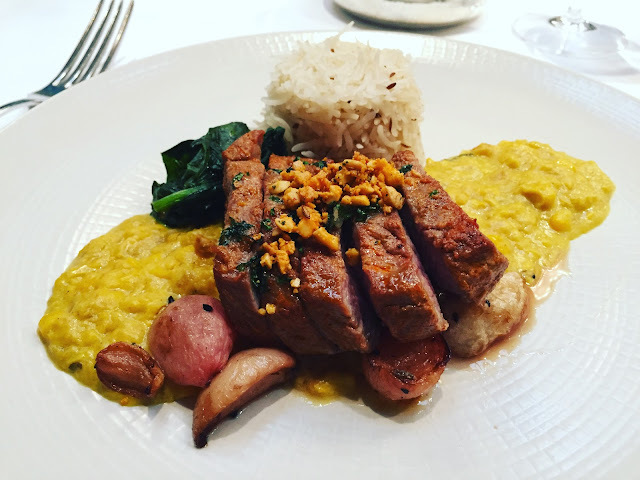 The duck was served over a sweet and creamy coconut flavoured sauce which had Thai influence, all served with a side of beautifully cooked and subtley spiced greens. The spiced leg mappas roll was really quite something - soft, juicy leg meat - spiced to perfection with a decadent crispy outer shell - I could have eaten a plate of them alone! My main course: Roast saddle of Romney Marsh lamb, corn sauce, pickled root vegetables, masala cashew nut. I definitely made a sound choice with my main course - stunning Romney Marsh lamb (my first time eating this wonderful lamb, but definitely not my last!) served with a corn sauce reminiscent of a chowder but with incredible Indian spicing - the crunch of the cashew nut worked so well with the silky sauce, and I loved the addition of the pickled vegetables which added sourness to the dish while you got a warmth/heat from the garlicky spinach, and some delicately flavoured rice to bring the whole meal together. I fear I may of devoured this whole dish without looking up or making conversation with Liam! Ha! Romance is dead. My dessert: Spiced almond and raspberry pudding with strawberry ice cream. 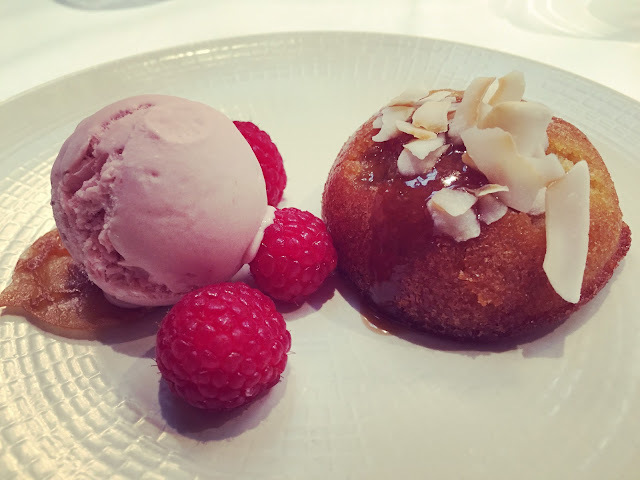 The finale of my meal was this hearty spiced almond and raspberry pudding served with strawberry ice cream - all the flavours of a delicious Bakewell pudding/tart with added spice! The cake itself was moist and sticky, not too heavy but certainly substantial enough to live up to its title of a pudding rather than a sponge. The strawberry ice cream was beautifully creamy and tasted of ACTUAL strawberries, unlike the fake strawberry-syrup flavouring of your standard strawberry ice cream. 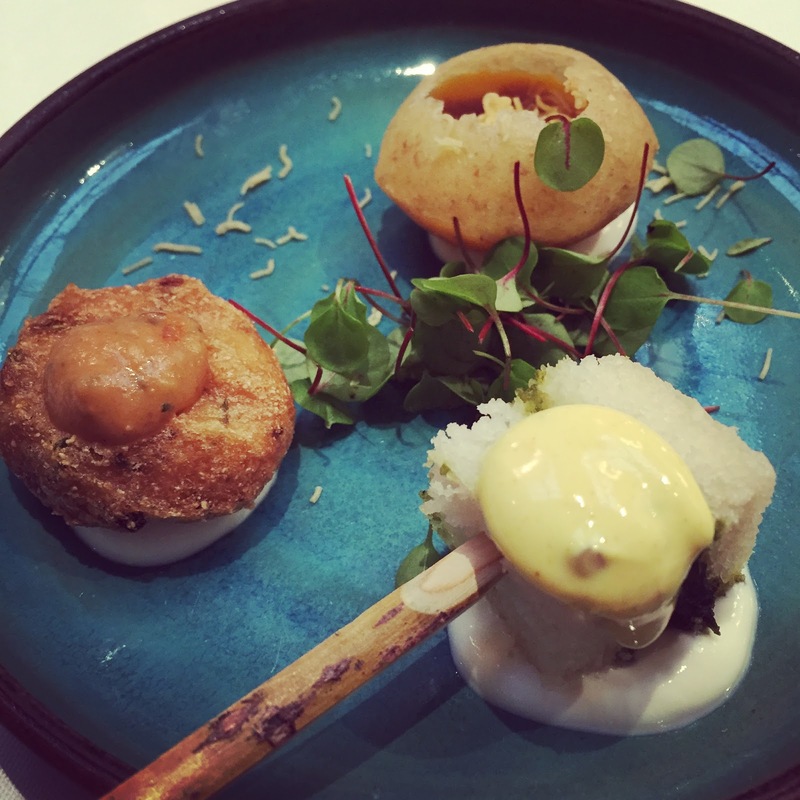 There was added crunch from a stunningly delicate leaf-shaped sugar tuile biscuit, and some crunchy coconut pieces on top of the pudding which ensured the dish echoed Indian vibes to the end. Hubby's starter: Kedgeree with smoked haddock and poached egg. 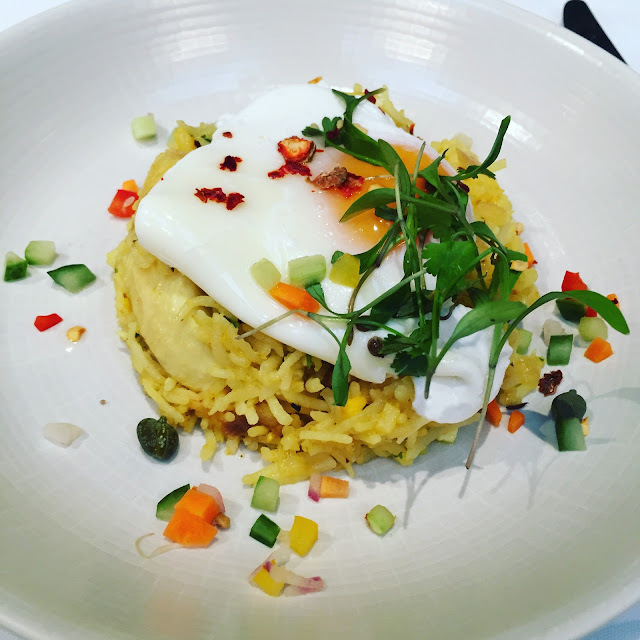 Liam is notoriously brave with his menu choices when we eat out - he loves to try new things, and this was his first taste of kedgeree. He loved it, especially the delicate spicing and he said he will definitely look out for it again on future menus. This dish fascinated me and I couldn't wait to try a mouthful - the flaky paratha was the best I've ever tasted, and dipped into the coriander chutney it was a true triumph. 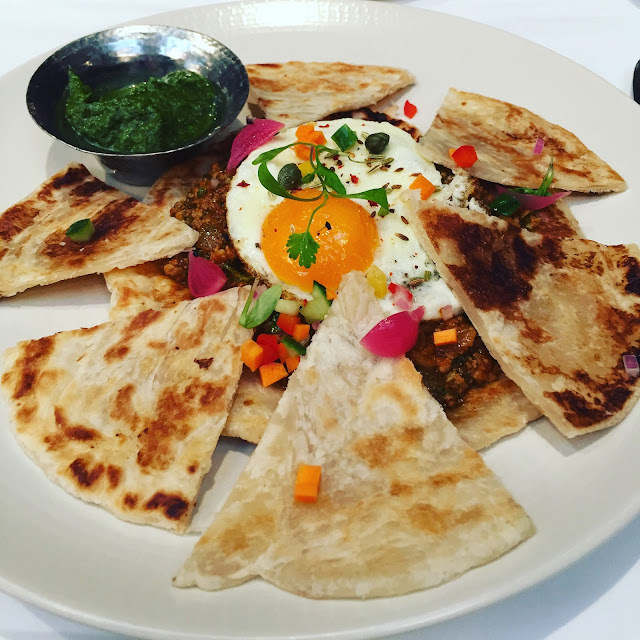 Hubby loved the heat from the spiced lamb mince, and the creaminess that the fried egg bought to the dish - quite an egg-centric meal for a man who only ate his first egg as an adult, due to an egg allergy as a baby! 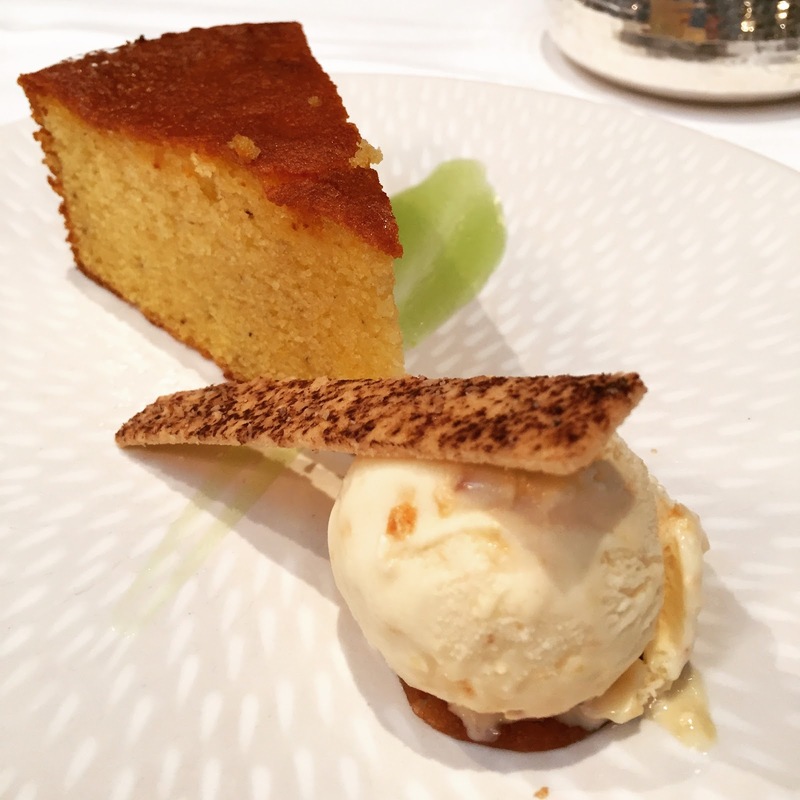 Finally, hubby ended on this spiced pumpkin and corn cake, with popcorn ice cream. The cake smelt incredible as the waiter placed our desserts in front of us, and Liam couldn't wait to dive in. The cake was as light as a feather and the balance of spice was absolutely perfect. A subtle flavour of popcorn filled the ice cream, along with a slightly chewy texture from the actual popcorn pieces set within the ice cream itself. Crunch was achieved from a lovely little addition of a biscuit/tuile and it was finished with a fresh vibrant green fruit gel which bought the whole dish together perfectly. A match made in heaven. CHEERS! Mr and Mrs B enjoying a glass of bubbly or two at The Cinnamon Club, Westminster. We washed our three courses down with some rather magnificent drinks. Firstly, we had our complimentary glass of champagne which came as part of the Bookatable deal - it was such a lovely rare treat to enjoy a glass of bubbly in peace with Liam. Secondly, we opted for a Cinnamon Bellini: it was a warm and decadent drink - the perfect thing to accompany my spicy lamb main course. 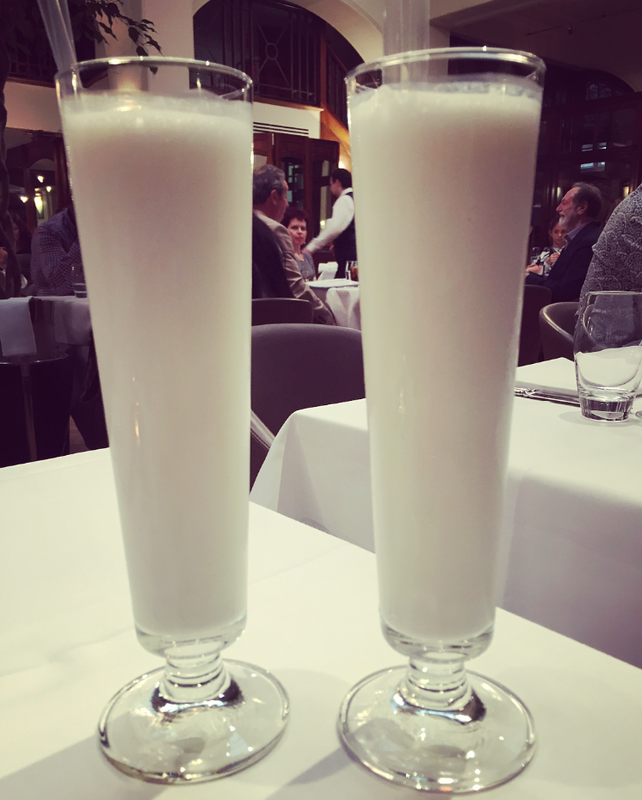 Finally, we chose a sweet, palate cleansing Sesame Vanilla Lassi drink to finish the meal off, we wanted to stay true to an authentic Indian experience, so we were eager to try The Cinnamon Club's take on this classic Indian yoghurt-based drink: this particular lassi was made with a mixture of sesame seed oil, vanilla, maple syrup and yoghurt, it was a slightly bitter, smoky, smooth drink with a subtlety sweet aftertaste, and was very soothing and cleansing after a spicy meal. Now then, I wouldn't be able to truly review a restaurant without talking about the loos - I find you can pretty much get the gist of a place, it's standards, from the rest room. Important factors for me are: cleanliness, decor, quality of cosmetics, hand drying facilities and space. The Cinnamon Club wins on all counts - the rest room was impeccably clean, modern and bright in it's decor, and had no other than L'occitane liquid hand soap (in Verbena, my fave!) on tap. There were fresh towels for hand drying as well as disposable paper towels (of very good quality) and there was plenty of space and mirrors to adjust your outfit, touch up your hair and make up etc without feeling cramped or uncomfortable. 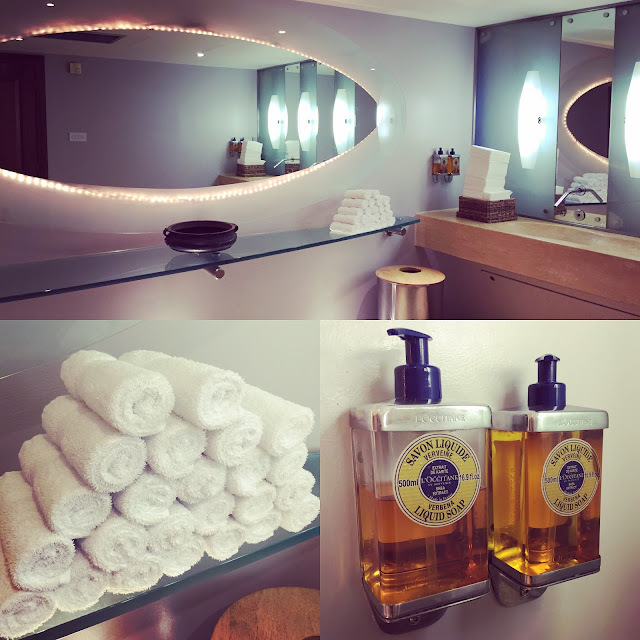 I do love a good rest room - especially when it's full of L'occitane products! We thoroughly enjoyed our visit to The Cinnamon Club and would whole-heartedly recommend you try it out - the Bookatable dining offer (of which there are a few from £30 per head) was incredibly good value for money. If you're a fan of Indian cuisine but so far have only sampled a madras from your local curry house then I urge you to try Indian fine dining for comparison - you'll never look at an onion bhagee or keema naan in quite the same way again. To book your own amazing dining experience at The Cinnamon Club with Bookatable then head to this website. Disclosure: We were gifted the full cost of this meal from Bookatable in return for our honest review. All words, pictures and opinions are my own. Wow, what an incredible restaurant, the setting is stunning! The food looks amazing too, your photos really do it justice. Great to know about how easy the booking process was too. How lovely for you and hubby to get out on a date night. I headed over to your blog after reading about it on Donna's blog at What the Redhead Said, I look forward to reading some more of your posts.